This basket was inspired by my summers spent visiting the NJ shore with my family. This beach bag holds just about everything and fits well behind any car seat. 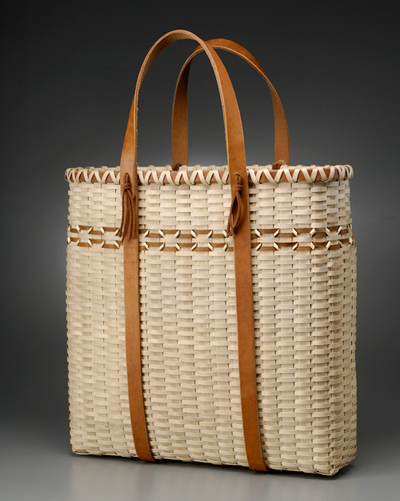 The full leather straps offer support for the bottom as well as becoming the basket handles. Highlights of Elm bark are added for design. It is woven with Black Ash splints. This is a “time proven classic”! Size shown: 18″ long x 16″ tall with 6″ top opening. Special order your own size tote to fit any of your needs. This useful carrier is not quite as bulky as a “Pack Basket”. 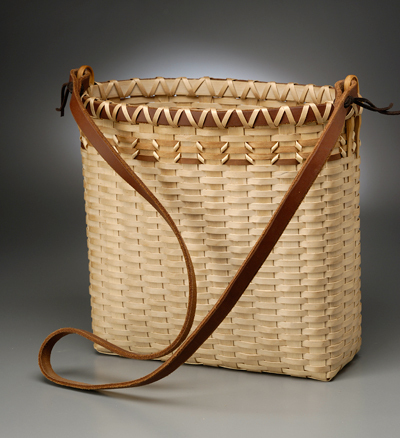 It fits comfortably on one’s shoulder with a leather strap that is attached to the basket thru whittled “ear” handles. Highlights of Elm bark woven into a herringbone design add color to this useful pack. Size shown: 12″ long x 11″ tall x 6″ wide. Special order your own useful size.